Come Delhi summer and there are mangoes everywhere. 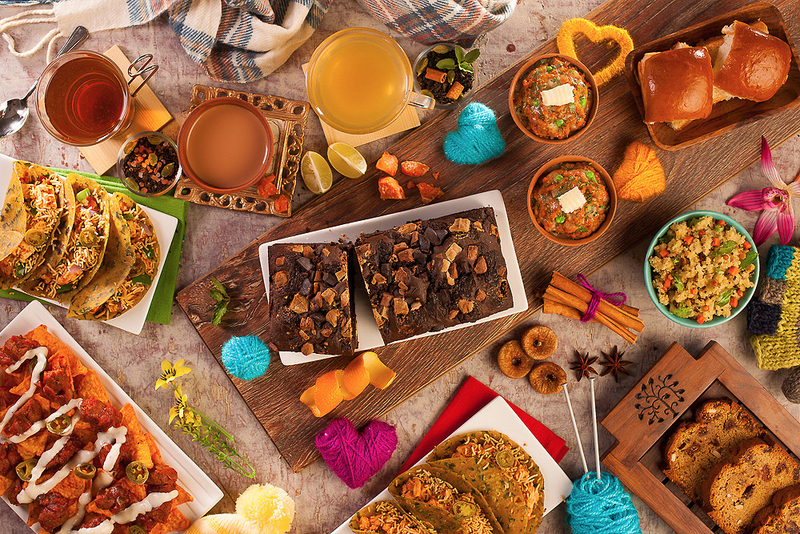 Market, home, cafes, dessert shops, social media feeds. It’s like everyone loses sight of every other delicious thing and gains tunnel-vision towards this “king of fruits”. My husband is one of them, religiously downing mango milkshake for breakfast and cut mangoes with or without ice cream as dessert after lunch and dinner. Strangely, I’m not a part of this fan club. Don’t get me wrong. I like them. Which is very different from love! Occasional, small doses work for me and my absolute favourite way of consuming rich, sweet mangoes is to have them with salt+red chilli paranthas. It’s my own little piece of sweet-and-savoury heaven. If you haven’t tried it yet, you’re really missing something! All this mango-bashing aside, I do truly love raw mangoes. 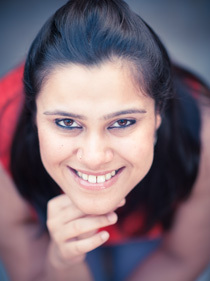 Maybe it’s because I’ve always loved chatpata more than meetha. Raw mangoes hit the spot for me in almost any form. Simply sprinkled with salt and chillies. Or as aam-panna. As a chutney. In a salad. And much more. 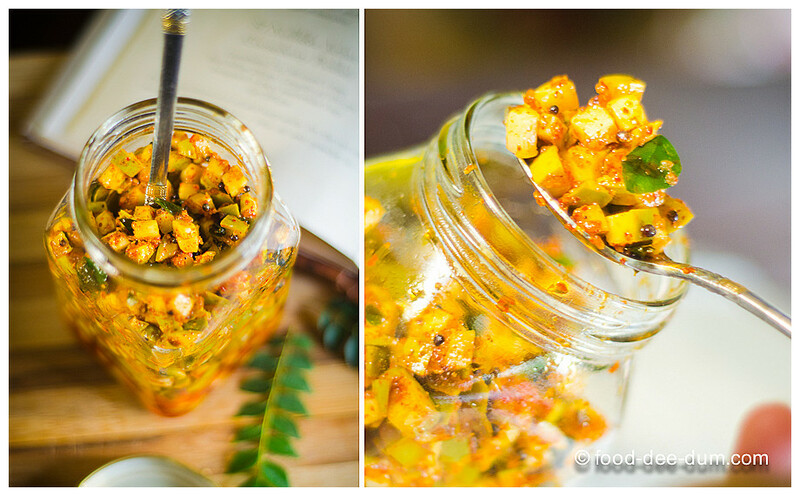 I first had this Kerala style raw mango pickle as part of the Onam Sadya and fell in love instantly. I filed it away for future reference, thinking that it must be complicated and that I would take my own sweet time to learn it. To my knowledge, pickles were not “instant” and required a lot of expertise and experience to get right. 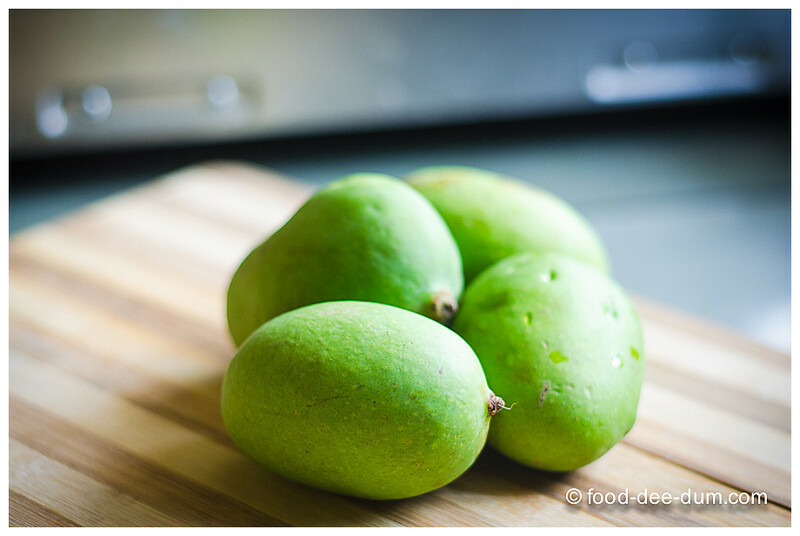 The next season, AK’s mom made us quite a few batches, with raw mangoes from her own garden. That should have tipped me off on how easy it was to make, since she’s the champion of quick and easy cooking! 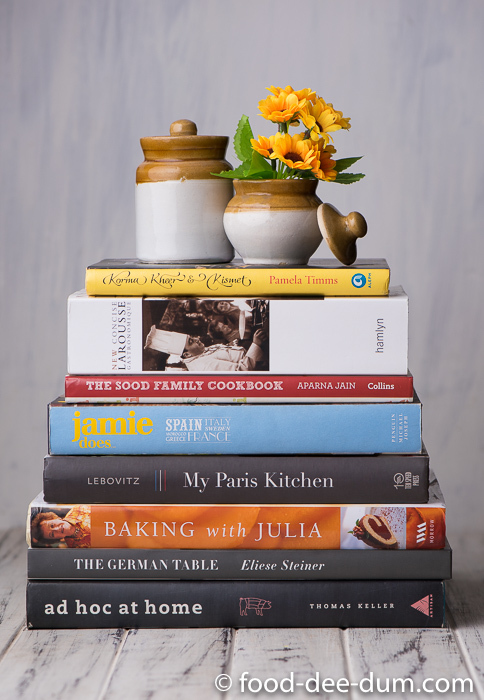 It was only when she brought back an old Kerala cookbook from one of her visits to her hometown that I realised it was so easy to make. (The book was actually gifted to her by her uncle. Obviously I pinched it and pretended that it was meant for me in the first place!). The chutneys and pickles section has quite a few gems and I’m going to get down to each one of them, slowly and surely. 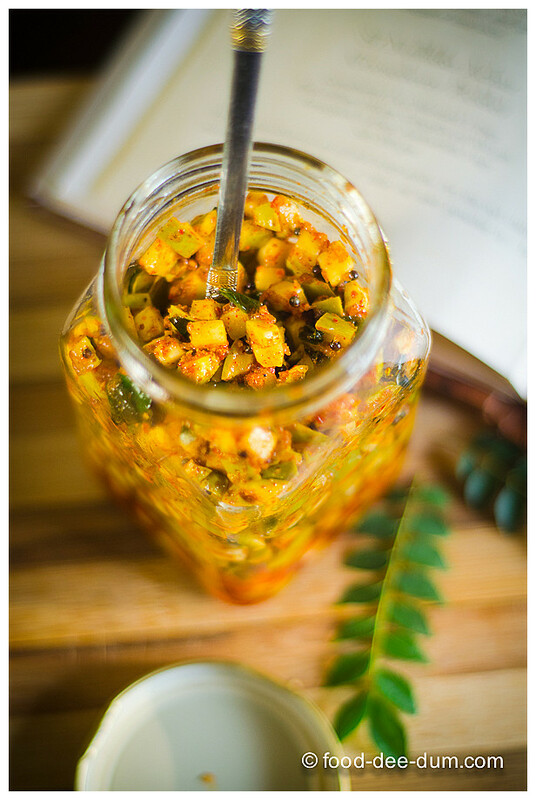 For now, let’s talk about this Raw Mango Pickle. It’s quick. It’s easy. No sunning and no precision. It’s irresistible and you WILL make more than one batch. I just know it. I washed the mangoes well (because we’re going to leave the peel on) and dried them. Placing these in a bowl, I added the salt and mixed it well. I let this sit for about 30 minutes so that the mangoes could release excess water. You can let it sit for up to 8-10 hours but in that case put it away in the refrigerator. I used the leftover scraps (that I couldn’t cut in an even dice, and you can see them at the bottom left of the above photo) to make 2 glasses of aam-panna to drink with lunch. Then I gently toasted the mustard, fenugreek and red chillies in a kadhai until they turned a shade or two darker and released their aroma. Allowing these to cool, I ground them to a powder in the smallest jar of my mixie. When the 30 minutes were up, I gave the mangoes+salt another mix, strained out the excess water released by the mangoes and then mixed in this chilli concoction. The colour of this mix and, consequently, the pickle is a little orange rather than red. If you would like the colour to be more red, you can add a dash of deggi mirch or even replace the dried red chillies with deggi mirch or kashmiri mirch powder. I washed the curry stalks and laid them out on a kitchen towel to drain the excess water — they are from my little balcony garden and looked a bit heat stricken so I thought some water would revive them! But I like to ensure curry leaves are always dry because they sputter so hard anyway that any excess water will just lead to serious mayhem. Warming the coconut oil in the same kadhai, I added the mustard seeds. 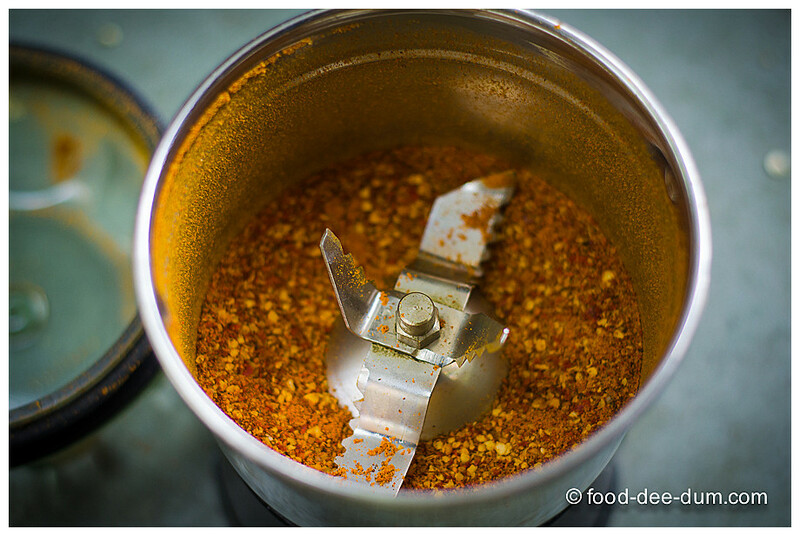 Before they started sputtering, I kept the asafoetida ready and took the curry leaves off the stalks. 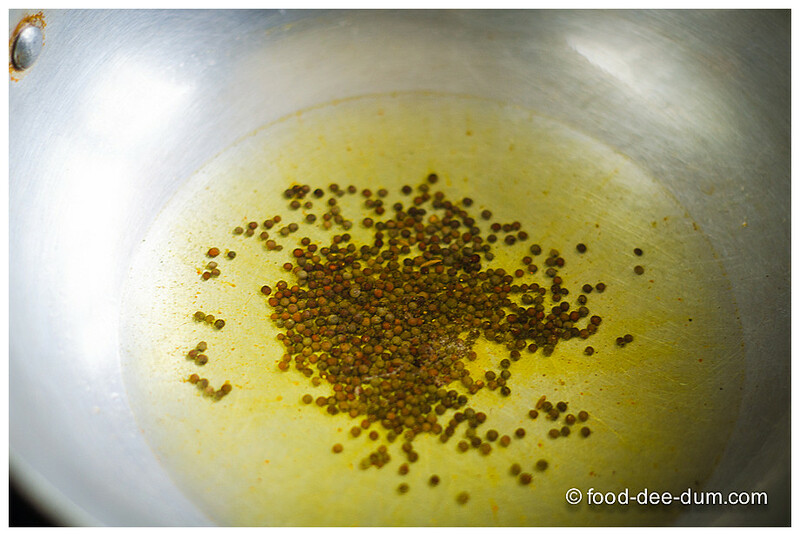 As soon as the mustard seeds started sputtering, I turned off the heat and added the curry leaves and asafoetida. Then I added the mangoes and gave everything a good mix. I allowed it to cool in the pan before transferring it to a clean, dry jar and refrigerating it. 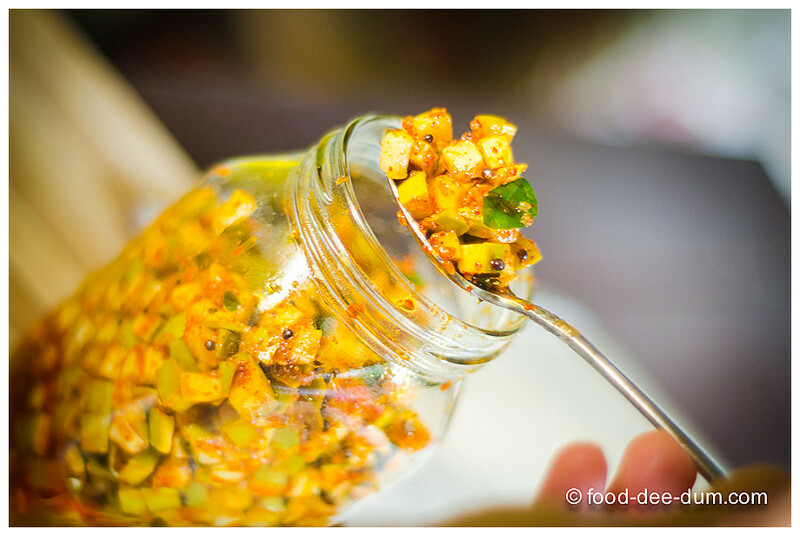 Always use a clean, dry spoon to take pickle from a jar else it will increase the chances of spoilage by a lot. Go on. Make it. I told you it was easy and instant. AK does NOT like the taste/ aroma of coconut oil in general. If you don’t either, feel free to use a more neutral oil. Also, the disadvantage of using coconut oil is that it solidifies in the refrigerator and you need to let the pickle come to room temperature before eating it. The mangoes have a little bite in them and are not completely softened in this process. 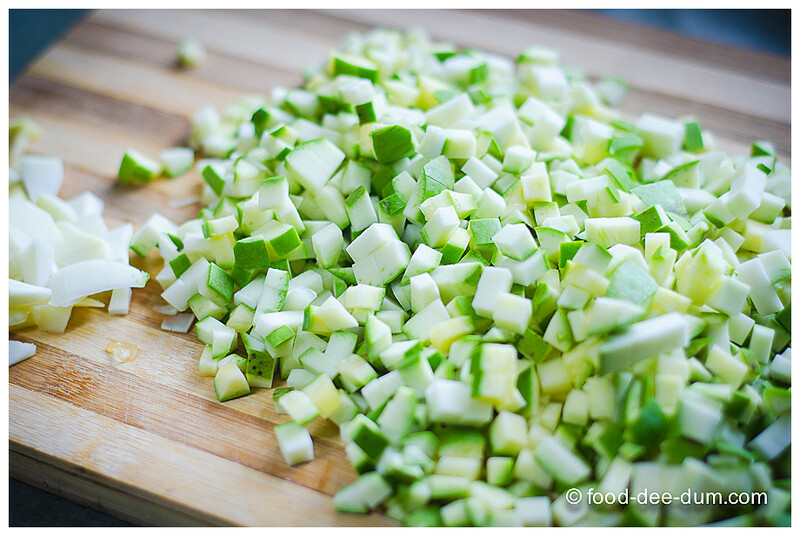 If you want them to be softer, you can (a) peel them or (b) after the tempering, cook them for about 5 minutes. I feel they get mushy in either of the 2 cases and prefer them with a bit of bite and crunch. But you should do what feels right to you. Wash and dry the mangoes well. Dice them into small even squares, keeping the peel on. 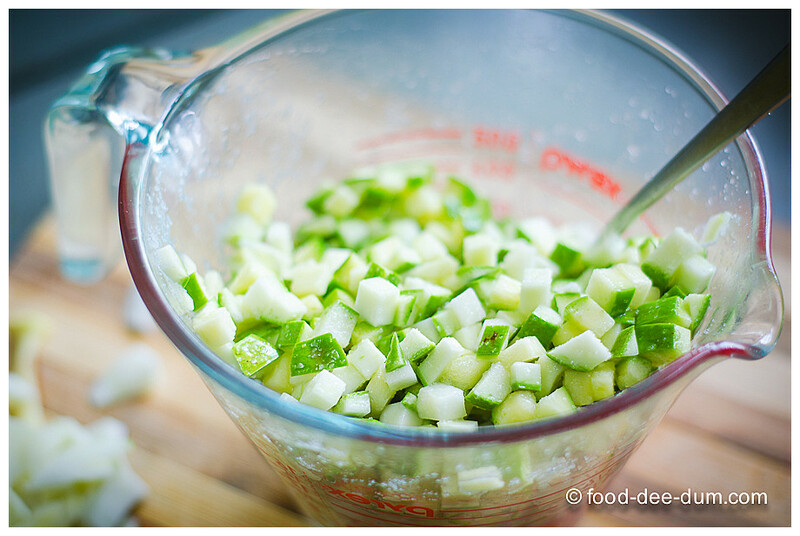 Place in a bowl, mix in the salt and let them sit to release excess water for about 30-40 minutes (minimum. 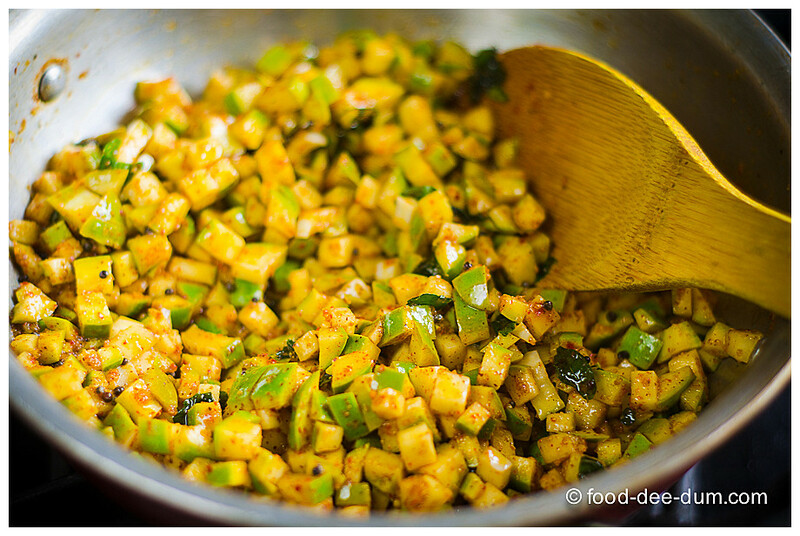 Can be left in the refrigerator for up to 8-10 hours). 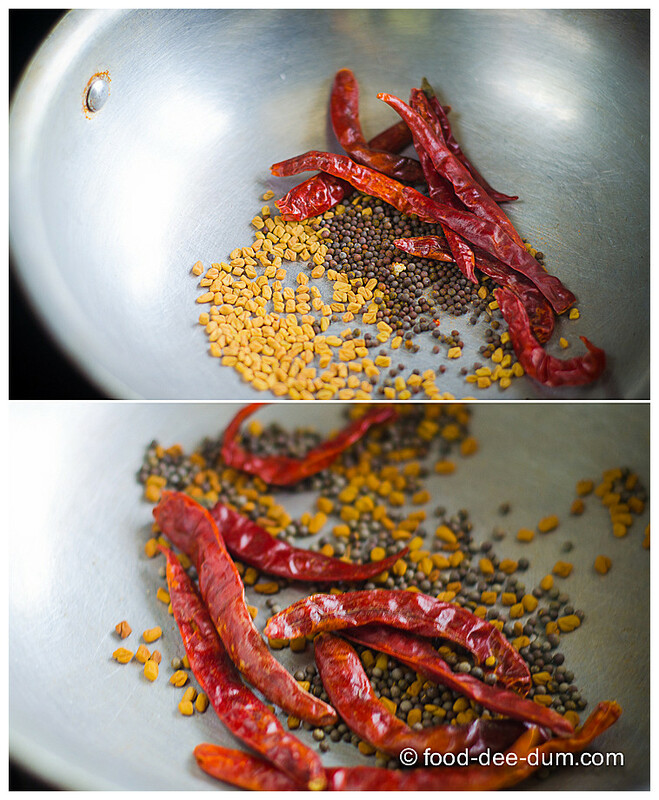 Lightly toast the mustard seeds, fenugreek seeds and dried red chillies together in a pan on high heat for 1-2 minutes until they turn a shade darker and are aromatic. Cool and grind to a powder. 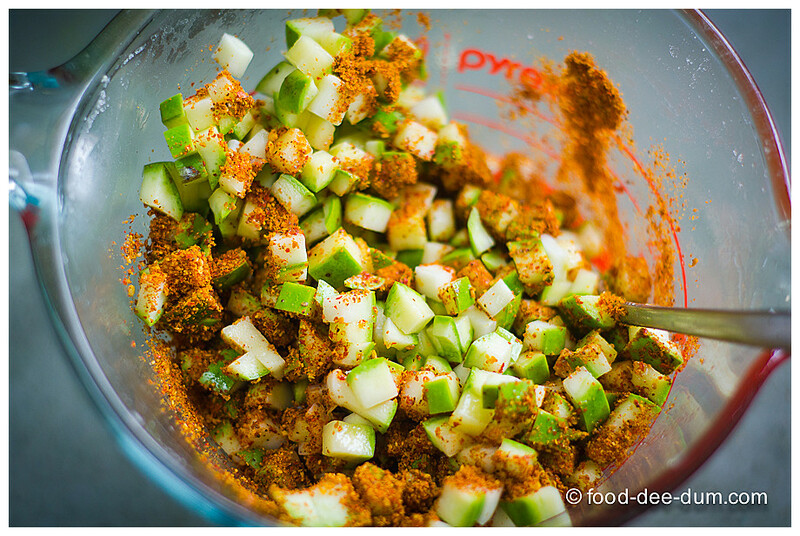 Once the 30 minutes are up, drain the excess water from the mangoes and mix in the chilli mix. 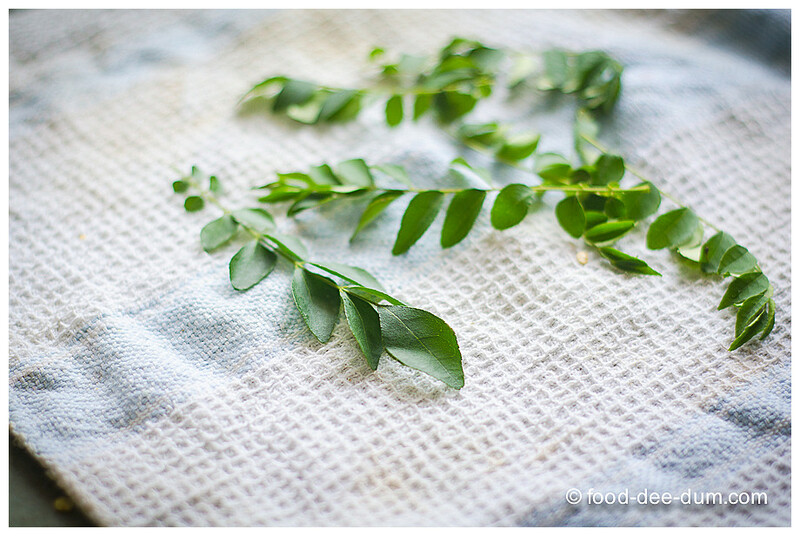 Wash the curry leaves and pat dry. Remove them from the stalks and discard stalks. Heat coconut oil in a pan and add the mustard seeds. 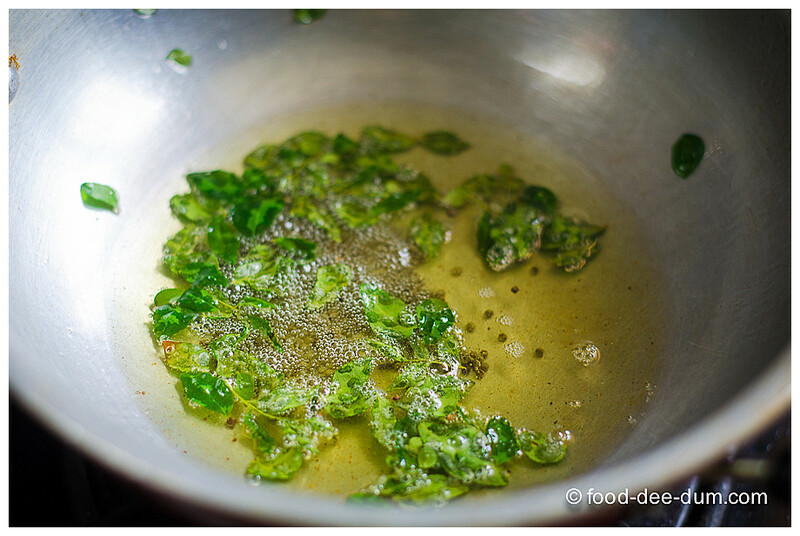 Once they begin to sputter, turn off the heat and add the curry leaves and asafoetida. Add the mangoes and mix well to combine. Let them cool in the pan before transferring to a clean, dry jar. This will keep in the refrigerator for 1-2 weeks.